My own observation: it might relate to: 謌 (uta/ka, sing or recite) ** and **彊 (彊 (kyō/tsuyo(i)) and 歌 (uta/ka, sing); which is カ、セイ? My own observation: it might relate to: 堵 (mistaken character) = fence, railing, enclosure. related: 蟷螂 (かまきり) = praying mantis (esp. the narrow-winged mantis, Tenodera angustipennis)​. In kotobank, it's: カマキリ類の総称. 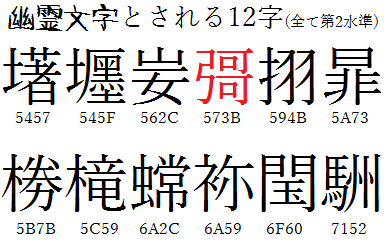 10.jisho: 閠 (intercalation, illegitimate throne) (Kun: うるう On:ケイ、 > ギョク、 ジュン). A mistake of 閏? All last three also don't have clear examples/usages. I find that these 'Japanese-only' Kanji fascinating. I can only take a glimpse of its meaning through the parts. I take that these must be obscure characters since it's included in "Ghost Kanji Characters". I couldn't find these characters in Chinese Dictionary either even though these are considered "Kanjis". 1.What are the usages and word-pairs/collocation or sentence example that represent the meaning(s) of these Kanji? How do you use it? How often? 2.As a native Japanese or a foreigner who lives for the longest time in Japan, have you used (or at least tried to use) these kanjis? 3.Is its usage only limited to research or linguistics study? 5.Are all my assumptions correct? I mean the misintended character? Did I miss something? Please help me to answer as thorough as possible so that we can contribute to this se. Short answer may suffice if you can summarize all the points well. Thank you very much for all your answers! The wikipedia page you linked has a section about usage. According to that, since the definition of ghost kanji is that there is no known usage, by definition, there is no past usage. After they appeared in the system by mistake, there has been some modern usage, but all examples mentioned in the article are misuse while trying to write a similar but different kanji. There are no truly intentional usage example mentioned in the article. Not the answer you're looking for? Browse other questions tagged meaning usage kanji archaic-language or ask your own question. In modern usage how do Japanese natives regard the differences between 外人, 外国人 and 外人さん?